A WITTY commercial for Adobe, the software firm, that aired last year showed a blissful team of executives and factory workers, who return to work when they think sales are up for their “Encyclopedia Atlantica”. It turns out that an adorable baby in nappies is repeatedly clicking “buy” on a computing tablet. Real-world companies share the imaginary encyclopedia publisher’s challenge of correctly sizing their audience, but are troubled by bots, not babies. 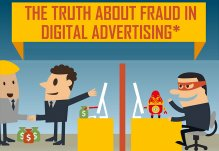 A dirty five-letter word is haunting the advertising community: fraud. This year online marketers will spend more than $140 billion on digital advertising globally, but billions will be siphoned off by clever fraudsters, who make money by falsely claiming advertisements have been seen by consumers. Evil-doers infect personal computers with a “bot”, a piece of software that visits websites in the background. It cannot be detected by the user, and is nearly impossible for advertisers to spot, because it shares the real user’s unique “cookie” identifier. Fraudsters have other tricks too: they can stack hundreds of adverts on top of each other on a website, or stuff a whole website into a small pixel on a page so advertisers think their ads are seen. Either way, they are deliberately claiming “views” and “clicks” for ads that no one ever sees. Such fraud is widespread across the online world. Some reckon non-human activity could account for around 30% of web traffic. The fraud is not evenly distributed, however. “It looks more like a cholera outbreak than background radiation. There are hot spots, ” says Michael Tiffany, the chief executive of White Ops, a company that works on fraud issues. The publishers that do what is known as “audience extension”, which involves selling adverts on other publishers’ sites, are particularly vulnerable, because their partners may not have sufficient safeguards in place. Mr Tiffany used to do cyber security for banks, but noticed fraudsters were moving into online advertising, because it is easier to avoid detection and get paid quickly. The allure of online advertising, versus the old, analogue type, is that it is more measurable and therefore reduces wasted spending. Widespread fraud could undermine that promise. Industry trade groups are trying to do more to raise awareness about fraud by boosting transparency in the digital advertising ecosystem to make it easier to police. Some website owners are offering refunds for traffic that is found to be fraudulent, although digital trickery remains extremely hard to detect. Bots are much harder to spot than babies. RT @mcpalerts: #VeriScanner can provide you all the data you need for a #competitor analysis on your competitions online #advertising!